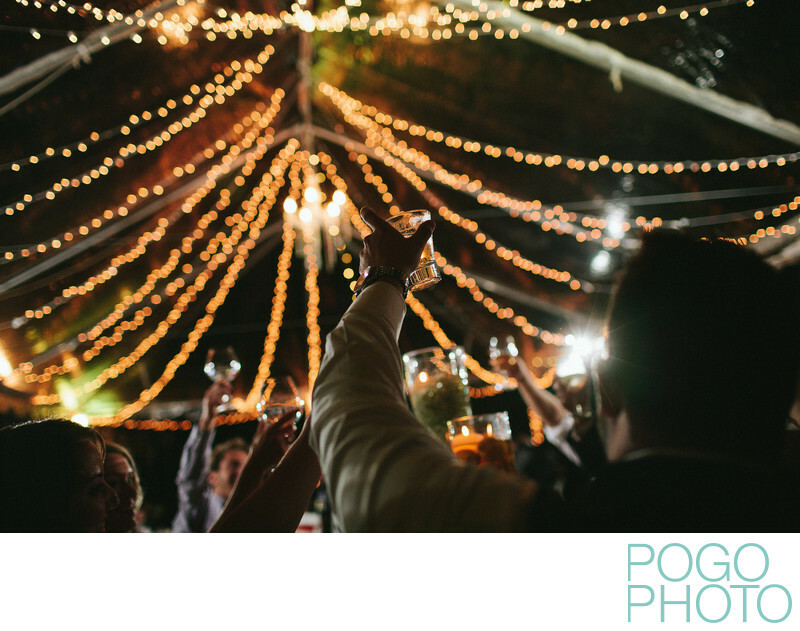 Fairy lights create the most beautiful bokeh and the best ambiance during any kind of reception, but particularly under the open sky or a clear wedding reception tent. What are fairy lights? They're the tiny white lights often put on Christmas trees, but with many, many strings of them they can be strung up as decoration in tents or other parts of a wedding for a unique and unforgettable element in the background of your wedding photographs. This image is a moment captured of the groom raising his glass to his best man's toast, with many other glasses raised in the background. The lines of the lights look almost as if they're filling glasses with light and excitement, giving this image a festive and celebratory look. The Ann Norton Sculpture Gardens is a lovely place for a wedding ceremony and reception, and having a clear tent can keep the beautiful night sky above you even as you plan for potential rain. Our preference for mixed on camera and off camera flash means that we aren't challenged by the lack of a white tent (we don't often bounce our flashes, as many photographers choose to do, because we like to use more variable techniques). Having the stars above the tent combined with the fun checkerboard dance floor often offered at this venue provides a fun “outdoor” feeling without risking an evening downpour.